So much yarn, so little time. : Meerkats on the radio! I took along a little meerkat who is going to be the mascot for the radio show this year - what an honour! Eagle-eyed Folksy sellers will spot a Folksy Festive Sampler on the table with us! I am loving having the Meerkat around! Today I am teaching him/her (still uncertain!) about 2-handed coloour knitting! 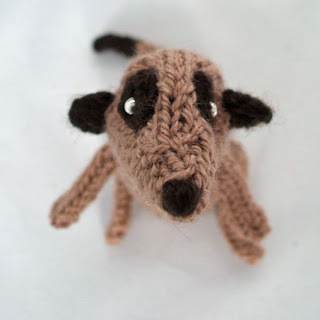 :-) Thanks so much again for meeting with me and knitting us our mascot; the whole team are really excited and I can't wait for next week's show when they will get to physically meet Meerkat and argue over who gets to be Meerkat babysitter *next* week! I shall send you over my longer version of the interview right now in case you want to use that anywhere. sorry I appear to have lost my spelling/grammar skillz. 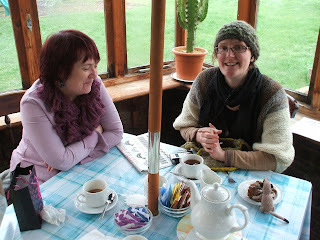 I meant colour not coloour - although I am sure 2-handed coloour knitting is also good? ...and next week when the Hub Team meet, we will of course be arguing over who gets to play with Meerkat the *following* week. Dear me. Next time I start commenting on blogs I should lay off the coffee beforehand. Oh, what a fun read and listen. Great interview Nifty! I liked when you said that knitting was one of the quietest things that you do. Arosha's ring has been named! VOTE VOTE VOTE for Arosha's ring! VALENTINES...do you remember your first time? More Meerkat World Tour news!